The durability of foundations should conform to BS EN 1990. 4.4.2.1 The durability of concrete should conform to BS EN 1992-1-1. 4.4.2.2 Exposure classes for concrete should be determined in accordance with BS EN 206 and BS 8500-1. 4.4.2.3 For the purpose of specifying concrete to be used in foundations, ground conditions should be classified in accordance with BS 8500-1:2015, Table A.2. NOTE 1 BS 8500-1:2015 and BS 8500-2:2015 are complementary British Standards to BS EN 206:2013. NOTE 2 Guidance on concrete in aggressive ground can be found in BRE Special Digest 1 . 4.4.3.1 The durability of steel should conform to BS EN 1993-1-1. 4.4.3.2 The durability of steel reinforcement in reinforced concrete should conform to BS EN 1992-1-1. NOTE Guidance on corrosion at bi-metallic contacts and its remediation can be found in PD 6484. NOTE 1 Information on the biological agents that can attack wood can be found in BS EN 335:2013, Annex C.
NOTE 2 Guidance on shipworm (various species of the genera Teredo and Banksia), Martesia, and gribble (various species of the genus Limnoria) can be found in BRE Technical Note 59 . 4.4.4.1.1 The preservative treatment of timber should conform to BS 8417. 4.4.4.1.2 Components should be machined so that they contain a high proportion of permeable sapwood. NOTE Wood species can be selected for permeability and sapwood content from the information given in BS EN 350-2.
be given a preservative treatment selected conforming to BS EN 351-1 and BS EN 460. NOTE BS EN 335-1:1992, BS EN 335-2:1992, and BS EN 335-3:1992 have been superseded by BS EN 335:2013. 4.4.4.1.4 All machining of timber, including notching, should be undertaken before applying preservative treatment. Service classes for timber should be determined in accordance with BS EN 1995-1-1. Use classes for timber should be determined in accordance with BS EN 335. NOTE 1 Use classes relevant to timber in earth retaining structures are summarized in Table 5. NOTE 2 BS EN 1995-1-1:2004 requires timber structures to be assigned to one of three «service classes». BS EN 335:2013 defines five «use classes» for wood and wood-based products. BS EN 335:2013, Annex A provides a possible mapping of service classes to use classes. The durability of masonry foundations should conform to BS EN 1996-1-1, BS EN 1996-2, and PD 6697. 4.5.1 The actions assumed in the geotechnical analysis of foundations should conform to BS EN 1991. 4.5.2 The actions assumed in the geotechnical analysis of foundations subject to traffic loading should additionally conform to the UK National Annex to BS EN 1991-2 and to PD 6694-1. 4.5.3 To conform to BS EN 1990:2002+A1:2005, 6.4.3.3(4), combinations of actions for accidental design situations should include either the accidental action itself or actions that occur after the accidental event. 4.5.4 The effects of dynamic and cyclic loads on the performance of a foundation should be considered. 4.5.5 For the verification of limit states GEO, EQU, and STR, the value of load classification factor defined in BS EN 1991-2:2003 should be taken as α = 1.1. This factor should be applied to the equivalent vertical loading for earthworks and the earth pressure effects due to rail traffic actions, according to the requirements of BS EN 1991-2:2003, 6.3.2(3)P and 6.3.6.4. The ultimate limit state design of a foundation should conform to BS EN 1997-1:2004+A1:2013, 2.4.7. The UK National Annex to BS EN 1997-1:2004+A1:2013 states that «it might be more appropriate to determine the design value of φ'cv directly, rather than apply the partial factor γφ (= 1.25 for limit state GEO, Set M2) to its characteristic value». 4.6.2.1 In accordance with BS EN 1997-1:2004+A1:2013, 2.4.5.2, the characteristic value of a geotechnical parameter should be selected as a cautious estimate of the value «affecting the occurrence of the limit state». The value of φ'k may therefore be selected as a peak value, a constant volume value, a residual value, or an intermediate value (as appropriate). 4.6.2.2 The design values of geotechnical parameters should conform to BS EN 1997-1:2004+A1:2013, 2.4.6.2.
γφ is the partial factor specified in the UK National Annex to BS EN 1997-1:2004+A1:2013. 4.6.2.4 If it is anticipated that there can be significant post-peak softening of the soil's shearing resistance, together with significant straining of the soil, then the peak angle of shearing resistance should not be selected as the value that affects the occurrence of the limit state. γφ,cv is a partial factor whose value is 1.0.
γφ,res is a partial factor whose value is 1.0. A serviceability limit state is a condition beyond which specific service requirements for the structure or foundation are no longer met. Serviceability requirements for foundations are commonly expressed as limiting criteria for settlement or heave. 4.7.1 The serviceability limit state design of a foundation should conform to BS EN 1997-1:2004+A1:2013, 2.4.8, 9.2 and 9.8. 4.7.2 The terminology used to describe foundation movements should conform to BS EN 1997-1:2004+A1:2013, Annex H(1) and Figure H.1. 4.7.3 Damage to masonry walls owing to ground movement should be classified in accordance with Behaviour of foundations and structures [N1]. NOTE Guidance on building response to ground movements can be found in the ICE manual of geotechnical engineering (2012), Volume I, Chapter 26 . 4.7.4 Particular consideration should be given to differential settlement, since this is normally more damaging to a completed structure than total settlement. 4.7.5 Consideration should be given to any adverse effect that total or differential foundation settlement might have on services entering the structure. 4.7.6 Consideration should also be given to the adverse effect of differential settlement on services, pavements, and rail tracks, particularly at discontinuities, noting that part of the settlement normally occurs during construction. 4.7.7 Continuous structures that are sensitive to settlement should be avoided when large differential settlements are expected. NOTE Structures may be split into a number of smaller independent units to minimize the effect of differential settlement between them. The stiffness of a framed structure may be reduced by modifying any cross bracing or altering the connections between the frame and the cladding. 4.8.1 The structural design of concrete foundations should conform to BS EN 1992, except where stated otherwise in this standard (see 6.9). 4.8.2 The structural design of steel foundations should conform to BS EN 1993. 4.8.3 The structural design of timber foundations should conform to BS EN 1995. NOTE For guidance on archaeological finds, see Annex D.
4.9.1.1 The execution of concrete foundations should conform to BS EN 13670. 4.9.1.2 The execution of steel foundations should conform to BS EN 1090. 4.9.1.3 The execution of pile foundations should also conform to 6.10. 4.9.1.4 The execution of underpinning should also conform to B.9. 4.9.1.5 The execution of helical steel pile foundations should also conform to A.7. 4.9.1.6 When a design necessitates a particular sequence of operations, these should be clearly indicated on the drawings or in the specification. NOTE 1 Information about construction processes can be found in the ICE manual of geotechnical engineering (2012), Volume II, Section 8 . NOTE 2 Attention is drawn to The Construction (Design and Management) Regulations 2015 , with regards to health and safety requirements for construction works, in particular Regulations 13 and 15 which deal with duties of contractors. 4.9.2.1 The design and construction of temporary excavations, trenches, pits and shafts should conform to BS 6031. 4.9.2.2 The procedural controls that should be applied to all aspects of temporary works should conform to BS 5975. Working platforms are temporary structures that provide a foundation for heavy construction plant. Although temporary, these are safety critical structures since bearing failure will have serious consequences in the event of overturning of the construction plant. It is important that working platforms are designed, installed, and operated appropriately for their intended use. 13) PAS 8811 and PAS 8812 are expected to be published in 2015. 4.9.3.2 Drilling and foundation equipment used for temporary works should conform to BS EN 16228. NOTE 1 Geosynthetics incorporated into the construction of granular working platforms might provide beneficial effects that enhance the stability of the working platform. NOTE 2 Guidance on ground conditions for construction plant can be found in Ground conditions for construction plant . NOTE 3 Guidance on the design, installation, maintenance, and repair ofground-supported working platforms for tracked plant can be found in BRE Report 470 . NOTE 4 Guidance on the design of geosynthetics can be found in CIRIA SP 123  and in manufacturers' publications. 4.9.4.1 The execution of deep mixing should conform to BS EN 14679. 4.9.4.2 The execution of grouting should conform to BS EN 12715. 4.9.4.3 The execution of jet grouting should conform to BS EN 12716. 4.9.4.4 The execution of hydraulically bound mixtures should conform to BS EN 14227. 4.9.4.5 The execution of deep vibration techniques (including vibro-compaction and vibro stone columns) should conform to BS EN 14731:2005. 4.9.4.6 The execution of vertical drainage (including vertical band drains) should conform to BS EN 15237. 4.10.1 Tests on foundations should conform to prEN ISO 22477, where appropriate. 4.10.2 Testing of pile foundations should also conform to 6.11. Supervision of construction of foundations should conform to BS EN 1997-1:2004+A1:2013, 4.2. NOTE Guidance on technical supervision of site works can be found in the ICE manual of geotechnical engineering (2012), Volume II, Chapter 96 . 4.11.2.1 Monitoring of foundations should conform to BS EN 1997-1:2004+A1:2013, 4.5.
any buried infrastructure or utilities. confirm that the structure continues to perform as required following construction. 4.11.2.4 Monitoring needed to implement the observational method should conform to BS EN 1997-1. NOTE Guidance on the principles of geotechnical monitoring can be found in the ICE manual of geotechnical engineering (2012), Volume II, Chapter 94 . 4.11.3.1 Maintenance of foundations should conform to BS EN 1997-1:2004+A1:2013, 4.6. 4.11.3.2 If the design of a foundation relies on a dewatering system, a maintenance programme for dewatering should be specified. BS EN 1997-1:2004+A1:2013, 2.8(1)P, requires the «assumptions, data, methods of calculation and result of the verification of safety and serviceability» to be recorded in the Geotechnical Design Report (GDR). Additionally, BS EN 1997-1:2004+A1:2013, 3.4.1(1)P, requires the results of a geotechnical investigation to be compiled in a Ground Investigation Report (GIR), which «shall form a part of the Geotechnical Design Report'». This standard extends this reporting regime to include a Geotechnical Feedback Report (GFR) that contains full records of the works constructed. These as-built records include information that will assist with future maintenance, design of additional works, and decommissioning of the works. The GFR could also go some way to satisfying the requirements of CDM Regulations  with regards to preparation of a health and safety file. None of these reports is the same as a geotechnical baseline report, which may be used on geotechnical projects for contractual purposes. The Ground Investigation Report for a foundation should conform to BS EN 1997-1:2004+A1:2013, 3.4. The Geotechnical Design Report for a foundation should conform to BS EN 1997-1:2004+A1:2013, 2.8. The Geotechnical Feedback Report is also known as a «close-out report». results of monitoring and testing conducted during construction. 4.12.3.2 The GFR should be tailored to suit the size and complexity of the works. data from monitoring instruments (e.g. piezometers, inclinometers, settlement gauges). NOTE 1 The preparation of the GFR is particularly important where the observational method of design has been used. NOTE 2 Guidance on the preparation of close-out reports can be found in the ICE manual of geotechnical engineering (2012), Volume II, Chapter 101 . 4.12.3.5 A copy of the Geotechnical Feedback Report should be provided to the owner/client. STRATEGIC FORUM FOR CONSTRUCTION PLANT SAFETY GROUP (2014), Ground conditions for construction plant, London: Construction Plant-hire Association. 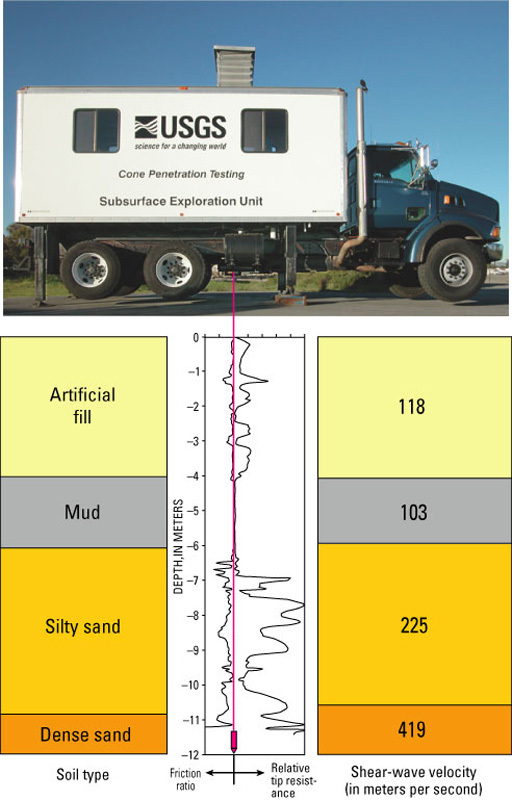 The U.S. Geological Survey Cone Penetration Testing (CPT) truck is a fast and inexpensive way to conduct shallow subsurface exploration. Detailed data are available immediately, permitting on-the-fly mapping of stratigraphy and other subsurface features.